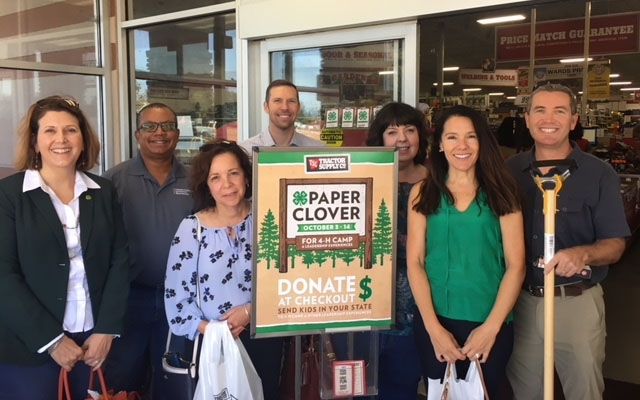 From left, Lorna Krkich, Greg Gibbs, Maria Fernandez, Kelly Scott, Emily Delk, Mary Ciricillo and Scott Brayton stopped by Tractor Supply in Dixon to buy 4-H Paper Clovers. UC ANR's 4-H Youth Development Program raised $80,619 for California youth from its supporters purchasing paper clovers at Tractor Supply for $1 or more Oct. 3–14, finishing second only to Texas in the 2018 Fall Paper Clover campaign during National 4-H Week. For the first time ever, 4-H nationally raised over $1 million in a single Paper Clover campaign. The $1,032,711 is the highest amount ever raised in the annual fundraising campaign. Enhancing the Tractor Supply Campaign was National 4-H Spirit Day on Oct. 9, on which everyone nationwide was encouraged to wear a 4-H shirt, a clover or green and post selfies on social media using #InspireKidstoDo or #TrueLeaders to show support for 4-H youth. People throughout the state turned green, including many right here at ANR. Katie Pannerella, director of Nutrition, Family and Consumer Sciences Program & Policy, and Zac Salinger, Master Food Preserver coordinator, show their 4-H spirit. 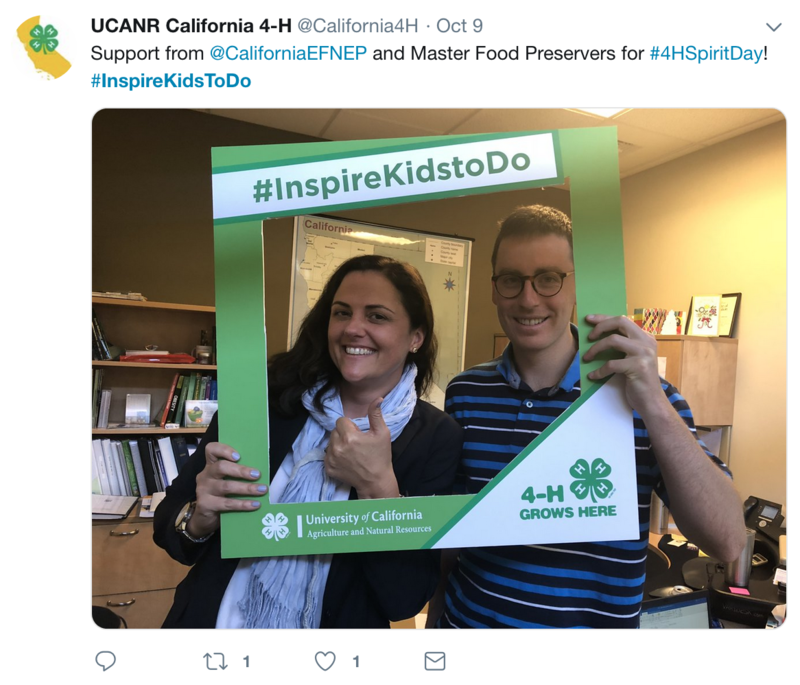 By posting photos of ANR employees demonstrating their 4-H spirit on social media, Suzanne Morikawa, marketing and communications specialist for 4-H and EFNEP, took the opportunity to show the connection between 4-H and other ANR programs. “We really appreciate our ANR colleagues participating in these fun ways to support our 4-H youth!” said Shannon Horrillo, statewide 4-H Program director. The Paper Clover campaign contributes to the support of California 4-H leadership and camp activities. The funds raised will benefit California 4-H members who wish to attend 4-H camps and leadership conferences across the country. Since it began in 2010, the partnership between Tractor Supply and 4-H has generated more than $11 million in essential funding nationwide. The Fresno County Board of Supervisors presented a proclamation to the local 4-H staff and youth. 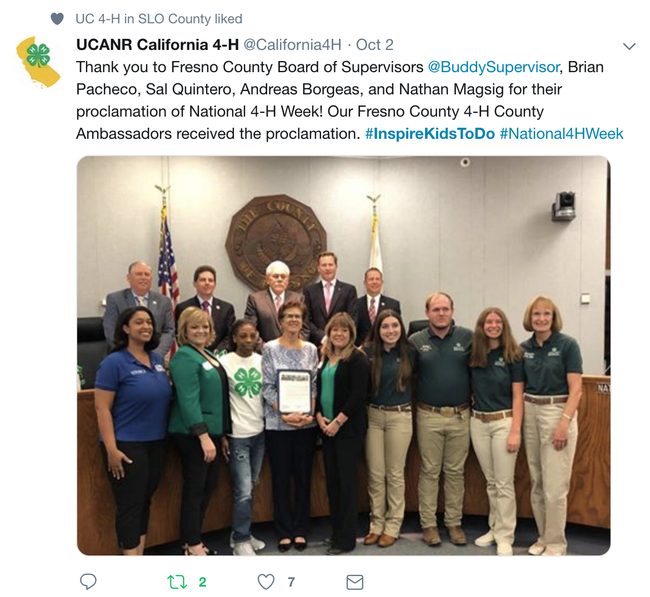 Boards of supervisors in Sonoma, Fresno, Marin, Glenn, San Luis Obispo, Mariposa, Santa Barbara, Kern, San Diego, Napa and Imperial counties presented their local 4-H members with resolutions or proclamations for National 4-H Week.